If the playoffs started tomorrow, the Lions would be in as a wild card entry. They have a 4-2 conference record and have the head-to-head edge over other NFC contenders such as the Bears and the Cowboys. The Lions' second-half schedule, which once seemed ominous, doesn't appear that way any more. Only the Bears and the Packers have winning records among the teams remaining on the Lions' schedule. The Giants, Eagles, Steelers, Buccaneers, Ravens and Vikings have all struggled and are below .500. The Lions stars are being stars. Matthew Stafford is on pace to throw for 5,234 yards, 32 TDs and just 12 interceptions. Calvin Johnson is leading the NFL in receiving yards and his 17.5 yards per catch ties his career-best in a season, and is on pace to score 14 TDs, close to his career high, despite missing a game. - Lake Orion's Jeff Heath has played exceptionally well in his first NFL start. His open-field strip of Reggie Bush during the third quarter was an exceptional play. He caught Calvin Johnson from behind on a long play in the first half. He's made a couple nice tackles in space and been in the right places in pass coverage at strong safety. Heath has also taken his regular shift on special teams. Impressive. - This has been a good game displaying the quality of GLIAC football. Brandon Carr from Flint and Grand Valley State is a starting cornerback for the Cowboys (he recovered a Calvin Johnson fumble in the third quarter). Joique Bell from Wayne State has played well at running back for the Lions' this season and last (he had a 22-yard reception in the third quarter). Heath played collegiately at Saginaw Valley State. Says a lot about the quality of Division II football in this state. - The Lions defense deserves a better fate than this. The unit has played reasonably well for the second straight week. - As nice a play as it was by Heath, it was also a mistake by Bush. The Lions have been horrible at taking care of the ball today. Other than one big play, this has also been a game Calvin Johnson would likely rather forget so far. Seldom has he displayed such a lack ball security. Two Lions' turnovers today are directly on him. But, as we all know, he is more than capable of making up for it. - It's a shame Ryan Broyles (Achilles) is hurt again today. Kid just can't get a break. Bill Bentley had a knee injury, which hurts the Lions' secondary. He's done far more good than had bad moments as the Lions' nickel back. The Lions have a better defense with Ziggy Ansah, as well. He's out with an ankle injury. The bye week could be coming at just the right time, in regard to injuries. - The Cowboys' Sean Lee has more interceptions (11) than any NFL linebacker since 2010, but none bigger than the one to end the first half. He was sitting on the route and made the play. That's study and preparation on his part. It was a poor pass by Lions' quarterback Matthew Stafford, who didn't recognize Lee lurking. Lee's first interception was on Calvin Johnson. That's a catch he should, and normally does, make. I'd be really surprised if Lee isn't a first-team All-Pro this season. In addition to the interceptions, he's a tackling machine. He entered Sunday as the NFL's second-leading tackler. - Usually, signing veteran free agent cornerbacks off the scrap heap doesn't work out, especially for the Lions. Drayton Florence and Brian Kelly come to mind from the not-too-distant Lions' past. But Rashean Mathis has worked out well for the Lions. The Lions are double-teaming Dez Bryant. The corner underneath has been Mathis. He is performing well. He's solidified their secondary and not forced the Lions' to rely on rookie Darius Slay, who clearly isn't ready to start yet. - The Lions' defensive line is playing exceptionally well in this game. One of the reasons it has played better this week than last is simply the Cowboys don't have nearly as good an offensive line as the Bengals. Love how the Lions' have placed Ndamukong Suh at defensive end at times today and just turned him loose. It's an overdue move. - Drag routes and deep square in patterns often work against the Tampa Two. Those patterns are there today, as well. Sometimes they are slow-developing routes. The key is pass protection. The Lions' offensive line is doing a good job of protecting Stafford again today. - The Lions are dropping too many passes today. Ryan Broyles, Reggie Bush, Johnson and Brandon Pettigrew have key drops today. The one by Broyles near the end of the first half was very hurtful. If he made that play, it would have put the Lions in field goal range, and the score would be likely be tied at 10 with momentum shifted back toward the Lions. - Gutsy call by Jim Schwartz to go for a TD on fourth and goal at the 2. I just wonder what took the Lions so long throw the ball to Calvin Johnson in the end zone. You could understand the runs on first or second down, but both? - I am surprised at the pace of this game. I thought it would be kind of a shootout, but instead it's been far more defense-oriented than I expected except for the long catch-and-run by Johnson on a pass from Matthew Stafford. 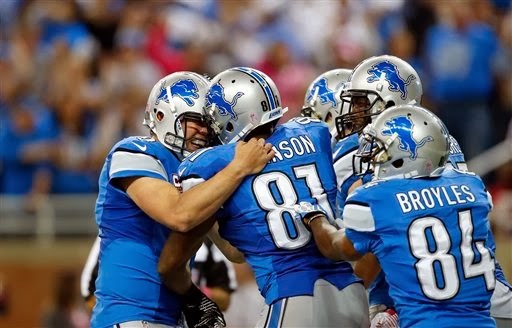 - The Lions' offense looked out-of-sync on their first two drives. Johnson made the big play to key the third. The Lions offense is lacking balance. It was passes on the first drive, runs on the second. - The Lions would be wise to take a lot of shots down field on Dallas' secondary. Not only is there a high probability of hitting on some of those plays, and the Cowboys are vulnerable in this area, but it would open up the underneath plays. Also, I feel like the Lions' would benefit from playing more uptempo, maybe going no huddle for a bit to shake things up. - I am not suggesting Joseph Randle is as good as Demarco Murray, but it is not like there is a dramatic dropoff at RB for the Cowboys today, either. He has a good size-speed combination and is decisive while hitting the hole. A classic downhill runner. - There are a lot of Cowboys' fans here today, but I am not sure if they are from Dallas or Metro Detroit. There are a lot of people who grew up in this area with the Cowboys as their No.1 team. The "Let's Go Cowboys" chants are annoying the Lions' fans here at Ford Field. - Cowboys offensive coordinator Bill Callahan and head coach Jason Garrett clearly love the one-on-matchup of rookie receiver Terrance Williams vs. Lions' CB Chris Houston. They have already taken two shots with plays deep in that direction. They've also gone that way with a couple shorter routes, too. Houston is more than holding his own, though, at least so far. - Ryan Broyles has to be 100 percent healthy if the Lions have him returning punts. - I can see why the Cowboys like rookie safety Jeff Heath from Lake Orion. He is a very good tackler. - This is a very good football game between two playoff-caliber teams. The Bengals probably have the best player personnel of any team the Lions have faced this season. Their performance today is hardly a surprise. But the Lions are hanging in there pretty well. - Tremendous catch-and-throw by Matthew Stafford to Calvin Johnson on the Lions' third quarter TD. Stafford has become more proficient at the back-shoulder throw, but it is not always the easiest catch to make because the ball is on top of the receiver so quickly. Johnson sure did his part by hanging onto it. The NFL QB who is the best at throwing the back-shoulder pass is Green Bay's Aaron Rodgers. He just does it over and over again, and nobody seems to be able to stop him and his receivers. - Cincinnati QB Andy Dalton is underrated. He has an excellent group of receivers to target, and he makes the best use of them. He is having a tremendous game. Bengals' receiver Marvin Jones could be a star in the not-to-distant future. Jay Gruden, the Bengals' offensive coordinator, has kept the Lions' defensive off-balance all day with his play calls. - Reggie Bush never should have been called for a chop block penalty. All he did was block the guy. He didn't even come close to hitting him in the knees. Brutal. - The Lions' special teams play has been much, much better this season, but they have had some hiccups on field goal attempts. It was very costly during the loss at Arizona. It was certainly hurtful when Cincinnati's Carlos Dunlap burst through and blocked an attempt late in the second quarter. How can a defender break through the middle of the line essentially untouched on a short attempt like that? Great question. I only know this, there is no good answer for it from the Lions' perspective. In some sense, it caused a 10-point swing. A potential 13-7 Lions' lead turned in 14-10 Bengals' halftime edge because Cincinnati responded after the block with a TD drive. - I don't believe people can accurately say Matthew Stafford doesn't make the receivers he plays with better. Looks to me like he is carving out NFL careers for Joseph Fauria (undrafted rookie free agent) and Kris Durham (castoff)..
- Yeah. I thought Bengals' safety Reggie Nelson should have gotten one of those hitting a defenseless receiver penalties when he clocked Calvin Johnson. They flag that play all the time. Why not there? The inconsistency of the calls on those type of plays is disappointing. Ndamukong Suh does that type of thing he'd get fined $200,000 and be thrown out of the game. - We got a strong dose, again, of what makes the Bengals' A.J. Green such a great wide receiver during the second quarter on back-to-back receptions from Andy Dalton. - Kind of weird to see another team take an after-the-whistle penalty against the Lions. What a dumb play by a solid veteran player, Bengals' tight end Jermaine Gresham. It took the wind out of the sails as the Bengals appeared to be on scoring march. Cincinnati kicker Mike Nugent ended up missing a 47-yard field goal attempt instead. - Chris Houston is a good football player, but not the type of corner you'd say is a shutdown corner. On the very best of the best receivers, such as Cincinnati's A.J. Green, he is going to need help from a safety over-the-top. Sometimes the Lions leave Houston alone on an island too often. It cost them an 82-yard TD play by Green in the first quarter. - You can see where Joseph Fauria is limited to jump balls in the end zone. Matthew Stafford dropped that pass perfectly in to him in the first quarter. He just missed it. Later, Stafford threw him a jump ball. Fauria caught it. That's his thing. - Bengals linebacker Vontaze Burfict is an outstanding player. It's like he is on every tackle. - I don't hear anybody complaining about Stafford throwing the ball sidearm. What a great throw on his short pass in the scoring zone to Kris Durham. He whipped it like he was second baseman turning a double play. It was also a laser accurate throw he made to Brandon Pettigrew for the TD. - This is the first time we've seen some yards after the catch by Durham. Progress. - The Lions' fumble return for a TD was negated by a penalty but you can definitely tell here the crowd noise at Ford Field is having a bearing on this game when Cincinnati has the ball. - What a terrible pitch by Jose Veras. Willie Hernandez used to called pitches like that "a hanging booger." Shane Victorino wasn't going to hit his fastball. It's not like he doesn't have a good one. The guy throws gas in the mid-90s. Yet, he might as well have just screamed before Victorino hit the grand slam, "Here comes the curveball." - Sometimes you'd settle for steady rather than flashy. See Jose Iglesias in the seventh inning. That should have been a double play. - Hey, Phil Coke did his job getting David Ortiz out, again. Small consolation, eh? - The Tigers' mental errors on the bases is a genuine flaw. Not only are they painfully slow overall, but not smart. Prince Fielder running to the double play turned a big frame into a two-run inning a sigh of relief by the Red Sox. The seventh inning would have proven to be a lot more damaging had Austin Jackson not gotten picked off first base. Those type of things are usually deadly. - Nobody in this town would ever dispute whether Victor Martinez is a terrific hitter, but his status in this town has risen even higher with this postseason. There is nobody in the world you'd have up in a clutch situation than VMart right now. What a pro. - I wasn't sure about Jim Leyland's decision to pull Jhonny Peralta for a pinch runner so early, but it was a lot more comforting when Don Kelly was in left field than Peralta when David Ortiz flipped that fly ball to left field in the sixth. Now, though, they could sure use Peralta's bat. One of those damned if you do, damned if you don't things. - Michigan seemed to have made a lot of progress defensively after the Rich Rodriguez years, but they have clearly regressed the last couple weeks. I keep expecting Mikel Leshoure to run the wheel route out of the backfield any minute now. This has the look of Michigan, Illinois in the Rich Rod years. Who knows, perhaps the Wolverines will eke out a two-point victory today like that 67-65 gem before the Josh Groban led swan song. - Where has Jeremy Gallon been lately? Can he do this type of thing vs. the better teams on Michigan's schedule? He has had his best games against mediocre teams and Notre Dame, hasn't he? - There are nothing but wide open receivers in this game. It's ridiculous. But Michigan is supposed to be over this type of crazy defenseless football. It is not. - This is about defense today, not good offense, isn't it? - Indiana's long pass for a touchdown in the first quarter was disturbing. Everybody knows Indiana runs a hurry-up, fast-tempo offense. Everyone knows Cody Latimer is a Indiana's most threatening receiver. There was no excuse for not being ready for the snap, nor not having bracket coverage over the top on Latimer on the play. On Indiana's second long TD pass to Shane Wynn, this one in the second quarter, there was a safety coming over the top, Jarrod Wilson. Yet, he took a horrible angle on the play. I can't recall a secondary, reputedly athletic, which plays the ball so poorly while it is in the air. And it's getting worse, not better. Heck, the Wolverines' secondary is so bad, perhaps even passing-challenged Michigan State will be able to throw the ball effectively against it. - I know Devin Gardner has been a turnover machine, but he is an incredibly gifted quarterback. He is an exceptionally smooth runner in space and there are times when he throws the ball with outstanding form and excellent accuracy. It's just he is so inconsistent it is maddening. But a half with no turnovers? That's a good thing. Gardner played an outstanding half of football. - It's good the Wolverines have managed to get Jeremy Gallon more involved in their offense. But I'm not sure if it isn't because Indiana is bad defensively rather than the Wolverines being good offensively. - Dennis Norfleet's kickoff return in the second quarter was comical, for all the wrong reasons. It's not the PS. That play was part of the Wolverines' growing problem with being fundamentally sound overall. - Hey, the Wolverines are leading by 10 points. Can't be that bad, right? - Talk about movement on a fastball. Red Sox closer Koji Uehara doesn't throw hard, but the ball comes out of his big glove late, making his velocity deceptive, and the movement on his fastball is almost freakish. - The way Jose Veras has thrown tonight points to how Jim Leyland pulled him too soon in Game 2 after he allowed a double. He threw really hard in the eighth inning, and displayed an excellent breaking ball. Veras was in total command. - Jose Iglesias has been utterly spectacular defensively in this game. I don't know exactly how his range on pop flies has projected on TV, but both those plays were both breathtaking to see in person. It was pure defensive brilliance. He has been impressive all along with the glove, but this has been the best yet. - Anibal Sanchez did an excellent job of settling down following a rough start after three innings. He minimized the damage a great deal by holding the Red Sox scoreless in the fourth, fifth and sixth innings. It has opened up the possibility of a Tigers' comeback. The Tigers are doing a decent job of hanging in there. We'll see what their much-maligned bullpen has. - Austin Jackson, on the rare occasions he has hit in this series, has done so to the opposite field. His swing on the double play ball in the sixth was not a good one. He should be trying to hit the ball through the middle. 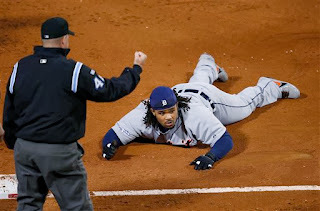 - It wasn't like Prince Fielder didn't come through with a hit with a runner in scoring position in the fifth inning, but it was, nonetheless, a profoundly disappointing at bat. He got himself out with a feeble swing on the first pitch, something he has been doing far too often during the postseason. - The station-to-station element of the Tigers' on the bases has particularly looked bad tonight, with Cabrera getting thrown out at home, and not getting to second when he singled deep into left-center field. - You hear it all the time in this town to the point it's almost because a trite cliché, but "Alex Avila takes an incredible beating behind home plate as the Tigers' catcher." But you what, it isn't just a saying, it's true. It's amazing, honestly. Any way Avila can get hit at his position, he does, and over and over. I've never seen anything quite like it. But Brayan Pena came up with a huge hit in his place in the sixth inning. - Miguel Cabrera is having a rough night. Horrible decision to try to score on the base hit, inexcusable error. The Red Sox have clearly adjusted to Anibal Sanchez after seeing him Game 1. They are not swinging at nearly as many pitches out of the strike zone. - I don't why, but I always laugh when I think of "small" ball after seeing somebody like Mike Napoli hit a 450-foot home run. By the way, it ranked with balls hit into the camera well in straightaway center field hit by Cabrera and the long-forgotten Eric Munson as the longest home runs I have seen hit at Comerica Park. - Rick Porcello could prove to be very valuable in this game for the Tigers. - Jon Lester is the best pitcher the Red Sox have, but he does look hittable tonight. It wasn't good, though, the Tigers let him off the hook in the first inning, and even worse have fallen behind early to Lester. He's much tougher than most to rally upon, but it's impossible. If Justin Verlander were on the mound for the Red Sox, it would have been impossible. The Tigers have done a good job of making Lester work. He is averaging nearly 20 pitches per inning. - I'm not surprised Alex Avila drove a ball deep to left field. He has power to left field. It's why I am perplexed the Red Sox present such an exaggerated shift on him, but it has worked. They almost got burned on the ball he hit in the second, though. - The Tigers needed Omar Infante to come through in that spot. He had a great matchup against Boston left-hander Craig Breslow and didn't take advantage of it. Breslow looked like he was going to be in trouble after walking the left-handed hitter Alex Avila. - The pitch Mike Napoli hit for a home off Justin Verlander in the seventh inning wasn't that bad a pitch. It was 96 mph, but it was out over the plate and did allow Napoli to extend his arms. Look, we've seen that before in this town from Napoli, the former Texas Ranger. He has tremendous power, but lacks consistency. He ran into one. It's what he does sometimes, For the record, it was Verlander's 100th pitch on a 3-2 count. You can't put this on Verlander. - Jarrod Saltalmacchia and Jonny Gomes pushed Verlander after Napoli's one-out home run. It was a 12 pitches before Verlander retired Gomes, but it could prove to be a key at bat in this game given the struggles of Detroit's bullpen. - The key for John Lackey, the Red Sox starter, was getting ahead in the count consistently. It allowed him to set up his breaking ball effectively. The Tigers' hitters helped him out a few times, though. - Jhonny Peralta has had some hot streaks before for the Tigers, never this consistently in such pressure situations. Yeah, I do believe he is earning himself a new contract for next season, despite the PED suspension. He could have handled it better on and off the field. Jose Iglesias would be ideal as the utility infielder. - The Red Sox inability to put quality swings against the Tigers' starting pitchers is stunning. They look completely confused by Justin Verlander so far today, just like Anibal Sanchez and Max Scherzer before him. Verlander left a bad pitch up over the plate to David Ortiz, and Andy Dirks tracked it down. It's about the only mistake he has made so far today. Brilliant work so far. - No, I don't believe Peralta would have caught the drive by Ortiz. - John Lackey had a pretty good year for the Red Sox in 2013. His ERA was just slightly higher than Verlander's and his WHIP considerably lower. It was actually the lowest WHIP of his career. And he's been in this situation before under postseason pressure. Jose Veras, Drew Smyly, Al Alburquerque, Joaquin Benoit...Max Scherzer had thrown 108 pitches, the borderline for being done. But this is the playoffs. I don't think it is an unfair second guess to wonder if manager Jim Leyland would have better served to leave Max Scherzer in this game. I think pretty much everybody in this town suspected the Tigers have been living on borrowed time with their bullpen and that their "lights out" performance Saturday night was misleading. - The votes are in before postseason play begins, but anybody who put Scherzer at the top of their AL Cy Young ballot must feel their vote has been verified based in how well he has performed in the postseason. He did look like the best starting pitcher in the AL tonight. Scherzer's brilliant 2013 season wasn't just the product of great run support. Clearly. - If Miguel Cabrera's power bat returns the rest of this postseason, and the signs are clearly there it is, the Tigers are really going to be tough from this point forward. - Sometimes the Tigers' defense is suspect, and certainly the starting lineup tonight was lacking range on the left side of the field, but they have been playing pretty well defensively lately. Then again. the Tigers' defense hasn't been tested very much because Detroit's pitchers are striking out so many hitters. - Great effort by Torii Hunter. Gotta love it. - Give credit where credit is due. It's not like David Ortiz has not done things like this before. He is a truly great clutch hitter. - You have to wonder what John Farrell was waiting for. I mean there seemed to be zero chance Clay Buchholz was going to get out of the jam. Zero. His pitches had flattened out and it was as if he was throwing glorified batting practice. And the Red Sox bullpen is well rested. It's the type of thing that could cost Boston the series. - Anybody still want Miguel Cabrera to sit out? Even at less than 100 percent, he is a tremendous hitter and has been difference maker for the Tigers in the postseason. - Max Scherzer has been unreal tonight. He's been even better than Anibal Sanchez last night. This is one of the greatest pitching performances by a staff ever so far in a series. It's not like the Red Sox don't have quality hitters. Also, Fenway Park is a band box. - The reality about Alex Avila is All Star season was misleading. He is an average hitter for a major league catcher and a pretty good defender who has done an extraordinary job of handling pitchers and keeping the ball in front of him in the postseason. But he does have power, although spotty, and runs into pitches at key times. He sure did tonight. - What a waste because of the interception late in the third quarter, but this is still a game the Lions' should win. We'll see if they have taken a step forward in regard to competitive poise during the fourth quarter. A top NFL team shakes off that interception. - One of the questions developing earlier in the season was whether Reggie Bush's success was because of the attention on Calvin Johnson, or whether because he is a genuine NFL star. Until the third quarter, it appeared as if it was all about Calvin Johnson. Certainly, it didn't go well for Bush last week at Green Bay. Or, really, in the first half today. However, it was much different during the third quarter. On the Lions' scoring drive early in the third quarter, Bush displayed rare explosiveness for an NFL back. - Clearly, Calvin Johnson isn't himself today. But we've seen him play many great games while ailing, The Lions apparently were saving him for the second half. It would be surprising if he doesn't play a prominent role during the fourth quarter. - Horrible end of the first half for the Lions. - There are two things the Lions can't afford. One is not having Calvin Johnson in the lineup. Another is Johnson dropping passes. Pretty uncharacteristic, isn't it? That was a huge first-down drop during the second quarter. It changed the course of the game as the Browns responded with a TD drive. - I have yet to see anything from Patrick Edwards to suggest he is remotely an NFL-caliber wide receiver. The drops by Edwards and Kris Durham on the Lions' final real drive of the half magnified their problems. - Lions' linebacker DeAndre Levy, again, showed why he has become one of the better linebackers in the NFL. That was a fantastic interception. Levy is fast and athletic, and is also strong at the point of attack. Levy is having a Pro Bowl-caliber season. Lions' general manager Martin Mayhew doesn't get enough credit for selecting him in the third round of his first draft in '09 out of Wisconsin. It wasn't an obvious pick, but it was a terrific one. I saw Levy play twice live his last year at Wisconsin vs. Michigan and MSU and he wasn't that impressive. It looked like he'd be a fourth- or fifth-round pick. It seemed like a stretch for the Lions to take him in the third round, but they were right. - What Durham does very well is make leaping and diving acrobatic receptions. What he isn't so good at is catching the ball in stride and making yards after the catch. It's because his route running isn't precise. He rounds his off his cuts and changes direction slowly. Part of it is his height and long legs. It makes it more difficult to plant and cut. - Matthew Stafford has done a terrific job of spreading the football around. Some might say he has missed on a couple passes, but I saw it more like Kris Durham and Calvin Johnson missed making makeable receptions. - Not a good quarter for Joe Haden, the Browns' much-hyped cornerback. The Lions are actually exploiting him more than avoiding him. - With all due respect to tight end Joseph Fauria, who has become a red zone TD reception specialist, but it's always good to see Calvin Johnson come up with touchdown receptions. It's a part of his game that was missing last season, but he flat out dropped a sure TD in the first quarter. - Browns' QB Brandon Weeden gets a lot of criticism for holding onto the ball for too long, but such criticism masks the real issue which is his lack of mobility. He is slow and simply doesnot move well in the pocket. - Gosh, the more I see of Sam Martin as the Lions' punter, the more I see him as a weapon. So far, he has done a terrific job of containing some of the best kick returners in the game. This week it is Travis Benjamin. Too bad the same can't be said for the Lions' secondary. - This is the ultimate example about why PITCHING IS THE GAME. All other factors pale in comparison. - The Tigers have left too many runners on base in this game. It's the type of thing that can be haunting in the end. - Fans are getting all over Joe West, the home plate umpire. I have no idea why MLB assigned him this game because of his many issues, but I do believe he is calling a good game behind the plate so far. - You can tell the Red Sox haven't seen Anibal Sanchez much. They swung at so many pitches out of the strike zone. They made adjustments third time around, but couldn't get the hit. - It's one thing to strikeout this many of Oakland's hitters, but it's a much bigger accomplishment against the Red Sox. It's a tremendous pitching performance. The Tigers' bullpen is coming through so far. I can't say I anticipated it. That's the best breaking ball I can remember Jose Veras throwing, and I saw him pitch quite a bit for the Astros before the Tigers' acquired him. - Anibal Sanchez has pitched some tremendous games since joining the Tigers near the trade deadline in 2012, but he has never had better command of the situation than he had after five innings. It was utter brilliance. David Ortiz is one of the best clutch hitters in recent MLB history. Striking him out with one out and a runner on second in the sixth was masterful, too. But the topper was fanning Stephen Drew to end the 6th with the bases loaded. Problem is, now the Tigers have to rely on their bullpen in the late innings at Fenway Park because Sanchez is spent. It's not a good thing. - What is it about the Tigers' tendency to run themselves out of innings? It was a base running mistake by Omar Infante to try to score from third base on a hard-hit ground ball to third base. These are type of mistakes happen over and over for the Tigers. There are no excuses or reasons for it. Just an example of bad baseball by an otherwise terrific team. - Victor Martinez is not fast, but he does hustle. Getting down the line as quickly as he possibly on the potential double play ball in the sixth inning could prove to be a huge play in this game or this series. A lot of slow runners would not have made the same type of effort because they just figure they are too slow to prevent a double play anyway. VMart is a true pro, everything a ball player should be in regard to competitive spirit. The Tigers are so much better with him returned to their lineup. - Although I disagreed with it at the time, I must admit it was the absolute right decision to put Jhonny Peralta on the postseason roster. The Tigers would sitting at home watching the A's face the Red Sox tonight without him, and this game would look somewhat bleak were he not in the lineup. - The turnovers by Michigan quarterback Devin Gardner are profoundly disappointing. He's a terrific talent, but it's almost like he turns over the ball two or three times each half. You see one extreme to the other. You know, like his brilliant run in the second quarter followed almost immediately by an inexplicable and inexcusable interception. The idea this is just his 11th start at QB and he is still inexperienced is preposterous. He is a senior (although he was redshirted and has another year in '14). He's had essentially a full season as a starting QB. He is being outplayed by Penn State's Christian Hackenberg, an 18-year-old true freshman. If Gardner doesn't stop being a turnover machine, Michigan is trouble, and the Wolverines will get waxed in East Lansing the first weekend of November. - Michigan's pass defense is awful. They also have little pass rush. It's weird because the Wolverines have good athletes in the secondary and on the defensive line..
- Brady Hoke entered this game with a 4-4 record in the Big Ten on the road. The Wolverines' road woes have become a trend. - Easily, the smartest and best thing the Wolverines have done lately is splitting out Devin Funchess and throwing to him a lot more. He's been the lone bright spot today for Michigan. - The more of Derrick Green, the better for Michigan. Let him carry the mail for awhile to see what he can do. Fitzgerald Toussaint is, at best, a solid Big Ten running back. Perhaps Green is a great one. Certainly, the size-speed combination is there. Haven't heard much Justin Verlander bashing lately? Wonder why? This is truly a gem. It could one of those nights for the ages. We'll see. - If you looked at the Tigers in the middle of the season, the two players fans had turned against the most were Verlander and Victor Martinez. It goes to show you how the game does, eventually, play to track records. Premier players eventually become premier players. We're seeing an example of it in this series. On top of it, Martinez has excellent leadership qualities. - The Tigers have left too many runners in scoring position. It's up to Verlander, by keeping the bullpen out of the game, to make it a non-factor. Oakland has a well-established tendency to rally late in games, especially at home. This is still too close for comfort to depend on the Tigers' bullpen. There is a much greater sense of comfort with Verlander on the mound. This is a night for Tigers' manager Jim Leyland to push Verlander's pitch count. - A's third baseman Jash Donaldson has played like anything but an MVP candidate in this series, offensively or defensively. He cost the A's a run with the throw in the dirt on a double-play ball. At the plate, it's like he keeps trying to hit a 5-run home run. - Oakland starter Sonny Gary doesn't have his good breaking ball tonight, and doesn't have a Plan B. It's kind of like Rick Porcello has been throughout much of his career, except with Porcello it's his two-seam fastball. Miguel Cabrera has been driving the ball deeper the last couple games, but it's been awhile since he's pulled one with that kind of authority. Again, he showed why he is the top hitter in baseball and a Hall of Famer. - Let the second guessers come out of the wood work now about A's manager Bob Melvin. Bartolo Colon did have an outstanding season and did shutdown the Tigers are the first inning of Game 1. Experience is on his side. - The Giants won the World Series last year after facing six elimination games. Playoff baseball can turn on a dime. We're seeing a classic example tonight. This is a great game, which could turn into a classic. It's amazing considering how it began under a such dark cloud of the Tigers' hitting slump. Certainly the crowd noise has picked up at Comerica Park. - Victor Martinez is the consummate professional ball player. He is not only productive, but he stays in the moment and doesn't flinch under pressure. That was a clutch home run off a really good reliever, who had been throwing well. - A's manager Bob Melvin did open himself up for criticism by bringing in lefty Sean Dolittle to start the seventh with the Tigers having so many right-handers coming up. He's a good reliever regardless, but does by far his best work against left-handed hitting. - I have no issue with Jim Leyland bringing in Max Scherzer in the seventh inning, even if he did allow a run. There is no tomorrow. Scherzer is the Tigers' best pitcher right now. He can pitch a lot of innings in a close game. And I do believe the Tigers' bullpen is a weakness, especially the middle relievers. Justin Verlander won Game 5 at Oakland last year, so his track record is evident. - It was a desperate plea by the A's on the fan inference on Martinez's home run. The ball was going to be a home run regardless. No Jeffrey Mayer situation there. - The decision to put Jhonny Peralta back on the roster and in left field looks genius right now. That was a huge home run, one which could turn around the series. - The Tigers are playing well defensively tonight. It's been a big factor in the game so far. Alex Avila, Torii Hunter and Prince Fielder have all made good plays defensively. Those plays kept the game from getting out of hand and helped a comeback. 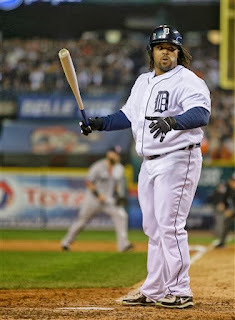 - Amazing how a pop fly single by Prince Fielder started all this. - Doug Fister has done an excellent job of gutting this one out. He clearly doesn't have his best stuff or command of the baseball, but he is still performing, and was doing it when it was looking its worst for the Tigers. - The worst part for Anibal Sanchez is he got ahead in the count to Brandon Moss before Moss clubbed his home run. The second home run, by Seth Smith, was wind driven to left, but the conditions should work well for the Tigers because they have more right-handed thunder, at least by reputation, than the A's. - Jim Leyland had little choice but to put left-hander Jose Alvarez into the game after Sanchez faltered. He is trying to flip the A's lineup to right-handed hitters, so he can make more effective use of his right-handed oriented bullpen late in the game. It wouldn't have been smart to use Drew Smyly at that point. He is one of the Tigers' set up guys. - Leading off the fifth, it would have more ideal for Jose Iglesias to try to reach base than take such a big cut at the ball. He does get out of the box quickly. The Tigers desperately needed a base runner down three runs. Yet, he was swinging from the heels as a hitter with limited power. - Those criticizing Leyland for not going to Rick Porcello to start the fifth inning are guilty of having ultimate 20-20 hindsight. It was a tie game. Sanchez is the AL ERA champ. It would have been a bizarre move to take him out of the game at that point. - The Tigers were kind of at the last-chance corral with moves to make to wake their slumping hitting attack. The last chance was Jhonny Peralta. The importance of his two-run single in the fourth inning can't be overstated. It was the type of moment which can change the course of a playoff series, especially a five-game set..
- Although he didn't exactly rip his base hit in the fourth inning, it was a good at bat for Prince Fielder because he fought so hard after falling behind in the count. No Tigers' player is under more of a microscope right now than Fielder because of his postseason struggles in the past. You kind of get this sense if he doesn't start to deliver, the Tigers' will be knocked out of the playoffs with incredible swiftness. - A's outfielder Josh Reddick is only going to hurt a pitcher with the velocity and late life of a pitcher like Anibal Sanchez if the pitch is down and in. That's exactly the pitch Sanchez handed to him on a silver platter. Adding to the mistake is that home plate umpire Gary Darling has had a generous pitcher's strike zone today up. - There wasn't much velocity on Peralta's throw to home plate from left field, but that run would have scored anyway if Andy Dirks were playing left field. Dirks does not throw particularly well. Certainly, the trade off of offense for defense has worked out well for the Tigers so far today. - I'm sure there are many pointing to Miguel Cabrera's health as the reason he made the run-causing error at third base during the third inning. However, he moved relatively well to make a play earlier in the game and ripped a hit his first time up. He has hit the ball on the nose a few times in this series. His ailments are no excuse for the error. It was just a misplay. - The A's have done a really good job of making Anibal Sanchez work for his outs. They have been patient at the plate. Throwing a constant wave of left-handed hitters helps. Sanchez's pitch count, 64 after just three innings, is alarming, though. Conversely, A's starter Jarrod Parker has thrown just 33 pitches. - I feel bad for Tigers fans about the start time of this game, and that it's only on the MLB Network. The television coverage of the ALDS on TBS, at least in this series, has been lacking, as well. You'd think it would be better if it were on FOX or ESPN. Also, it isn't it kind of ridiculous to start this game at 10 in the morning on the West Coast on a week day. It's not like the Bay Arena is a small media market. - The Lions' secondary is often maligned, but it has done an excellent job in the scoring zone today. It's no small accomplishment. A strength of the Packers' receivers is production in the scoring zone. Green Bay QB Aaron Rodgers is a master at the back-shoulder throw. None of it is working today, at least so far, because of the coverage of the Lions' defensive backs. Conversely, letting James Jones get deep like that for an 83-yard TD play is inexcusable. A botched coverage? I'm not so sure. There was only one safety trying to bracket two receivers. Also, Rodgers had all day to throw the ball. It was a bad play, a slip on a day when the Lions' offense, without Calvin Johnson, is presenting little margin for error for the defense. - Love the innovative play-calling by the Packers. Getting Randall Cobb into the backfield and out on the edge as a surprise maneuver was brilliant. - The Lions' offense without Calvin Johnson is like the Tigers' hitting attack with Miguel Cabrera ailing. It's just not the same. Detroit's defense is stepping forward today, though. - I don't understand the thought process behind constantly throwing third-down passes short of first-down yardage, especially on out routes, and not slant passes caught in stride in which there is at least a chance to run for the necessary yards. - That was a sweet catch by Ryan Broyles late in the second quarter. The Lions need that type of thing from him so badly today. Also, that might have been the most athleticism we've ever seen from Brandon Pettigrew on his reception late in the period. It was stunning, really, considering how plodding Pettigrew usually looks when he receives the ball in space. Kris Durham should have held onto that one pass, although, I will say in his defense, he does seem to be the one player the NFL allows to be speared without a penalty ensuring. - Great field goal by David Akers. He just drilled a 53-yarder. Is that same kicker who was so lame against the Cardinals? Hard to believe. - Fifth-round draft choice Sam Martin has been increasingly impressive as the Lions' punter. I wasn't so sure it was a good selection on draft day, but it definitely appears like it was wise a move now. It does, however, seem like every team the Lions face has a better return specialist than Michael Spurlock. - The Packers' wide receivers are terrific. Jordy Nelson and Randall Cobb have both made outstanding catches in this game. James Jones is a top player, who caught 14 TD passes last season. Nelson is particularly underrated. He has an excellent combination of size, speed and body control. - Ah, there is so separation from the Lions wide receivers without Calvin Johnson out. The Packers' defense has crept a lot closer to the line of scrimmage. - Holding the Packers to a field goal after a 15-play, 72-yard drive was beyond huge. Certainly, to this point, this game has been anything but the shootout some were expecting. - A lot of people will be down on Ndamukong Suh for getting a tripping penalty. Maybe it was unnecessary. However, Suh was clearly being held on the play. His frustration is understood. It should have been off-setting infractions. - Ziggy Ansah is an amazingly instinctive football player. He has an incredible knack for finding the ball for a defensive lineman. It wouldn't be a surprise if he reaches double digits in sacks this season. - Stretching the field could prove to be nearly impossible today for the Lions without Johnson. But the Packers' secondary doesn't exactly play with a sense of confidence. There should still be some underneath routes open. Ideally, the Lions will get a long catch-and-run play or two today from Reggie Bush. - Oh boy, this is one of those officiating crews that calls EVERYTHING. Sometimes I wish the NFL would just let these guys play. - I keep expecting Michigan's defense to be more stout, but it just isn't happening. Minnesota's offense is terrible by Big Ten standards, yet the Gophers have moved the ball surprisingly well. It looks to me like a team such as Northwestern will just roll against this defense. Maybe even Indiana, which remains defensively challenged, but has an underrated offense. - Devin Gardner is playing much more under control today. That's a good thing for Michigan. He doesn't need to get rid of his swagger, but there is an obvious need to take better care of the ball. The reason Minnesota has not threatened more today is directly tied to Gardner not turning the ball over. It's what gave Akron and UConn such life. - Minnesota's doing the type of things necessary to give Michigan problems today. The Gophers are controlling the clock. They pinned the Wolverines against the goal line with a punt. They haven't turned the ball over. However, this is a team Michigan matches up with well. The Wolverines should win this game rather handily, in my opinion. It's a matter of Michigan opening up their offense a bit and getting a turnover or two. Minnesota will probably self-destruct at some point. Unlike the last home game and Akron, the Gophers' passing game is not constructed for a comeback. - Two weapons I don't think the Wolverines make enough use of are tight end Devin Funchess and wide receiver Jehu Chesson. Gardner did target those two a bit more at the end of the first half, hitting Funchess a couple times, once with a pretty TD toss. It should become a habit because it will eventually pay off. They are Michigan's most gifted receivers. - The Wolverines' special teams since Brady Hoke has been head coach have been decidedly average. They haven't broken a lot of big plays, nor allowed a lot of big plays against. You'd think, however, with Michigan's celebrated recruiting classes, they'd find a game-breaking returner. Drew Dileo and Dennis Norfleet are just OK.
- Michigan's defense has not looked good against strong-armed quarterbacks this year, but there is a different element in this game. Minnesota QB Mitch Leidner isn't much of a downfield passer, but he is a very good runner. He's like a big tailback at QB, kind of a more limited version of Jordan Lynch of Northern Illinois, and Tim Tebow when he played at Florida. He presents a unique challenge for the Wolverines' defense. You saw that on the long drive at the end of the quarter which tied the game at seven. - Michigan's first drive was impressive. Minnesota's defense is particularly vulnerable to a solid inside running game. Mark Weisman, Iowa's tailback, tore up the Minnesota defense last week. Wolverines are presenting more of the same. - Minnesota coach Jerry Kill missing this game because of seizures is going to hurt the Gophers, obviously, but there also could an inspiring element to it. - If the Tigers are protecting a one-run lead in the eighth, at some point they must consider using closer Joquin Benoit for more than an inning. He's certainly rested. - If the Tigers lose this game, it will be every bit as much because of not taking an advantage of a vulnerable Bartolo Colon in the early innings as any pitching issues. Max Scherzer has pitched well by any standards tonight. - We'll see if the A's bullpen lives up to its reputation. The Tigers will get a shot at it in the late innings, too. - Simply put, a horrible decision to send Victor Martinez home on Omar Infante's hit to right field. The ball was hit hard, Josh Reddick has a strong throwing arm and Victor Martinez is a painfully slow runner at this point of his career. There was only one out at that point. It wasn't a difficult play. It was simply the Tigers' running themselves out of potentially big inning. - Oakland did an excellent job of driving Max Scherzer's pitch count up. It's not Scherzer's fault. He is throwing strikes early in the count, but the A's are forcing him to get them out, rather than getting themselves out. Looks like the Tigers' bullpen will get tested tonight. The A's are known for their propensity to rally in the late innings. - Two things need to happen to make this a lot easier for the Tigers. Either they get a big lead or Max Scherzer goes at least seven innings. If it is within three runs and Scherzer isn't on the mound through the seventh inning, it will be far too close for comfort given the Tigers' suspect bullpen. Scherzer's pitch count (49) is far above ideal after three innings. - The Tigers were so successful in the first inning because they didn't try to do too much with the pitches up in the strike zone at just the right velocity handed them on a silver platter by A's starter Bartolo Colon. They merely placed the bat on the ball and hit line drives. They were very solid at bats, and a sign of the Tigers' collective experience. Colon has done a much better job of getting the ball down since. - Scherzer did a terrific job of getting out of the jam in the second inning after Yoenis Cespedes clubbed a triple for the A's. The ball was hit well. but I thought it was a play left fielder Andy Dirks should have made. - Miguel Cabrera looks like he is moving better in the field and running slightly better than he did at the end of the regular season, at least so far.